Back to School night can be fraught with anxiety. Parents and teachers alike want to make good first impressions. Both parents and teachers know that a good relationship with each other will smooth the way for a productive school year. One way to put everyone at ease in your classroom on Back-to-School night is to play some ice-breaker games to help the parents get to know each other and you. These quick games won’t require anyone to take huge social risks with people they barely know–they’re geared toward fun and putting people at ease. Use them to put parents at ease before you begin your presentation. 2. Ask parents to tell three attributes they share with their child. 3. Take turns having parents tell what they would bring for show-and-tell if they were in school today, and why. 4. Have parents name two things their child is good at. 5. Break the group into partners and have them quickly find something in common (i.e. both like chocolate.) Have that group interact with another group and find something in common (i.e. all like music.) Continue until you discover at least one thing everyone in the group has in common. 7. Form small groups and ask each member what person, dead or alive, would the others invite to dinner and why. 8. Form small groups and go around the circle sharing favorite school memories. 9. In small groups, have parents take turns telling the others three things about themselves that are true and one lie. Have the rest of the group guess which one is the lie. 10. Ask to share one thing that they learned when they were their child’s age. 11. Form partners where neither knows the other. Then do a two-minute interview, answering questions like, “What is your favorite time of day? What is the nicest thing anyone has ever done for you? Name one thing you are grateful for.” Then take turns introducing each other to the larger group. Make sure to keep ice-breakers light and enjoyable for your class parents, avoiding embarrassment and creating an atmosphere that fosters a sense of commonality and belonging. 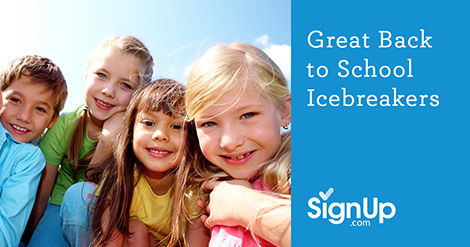 For even more fun, try these ice-breakers with your students, too!